Dogs insist on eating everything they find on the floor. 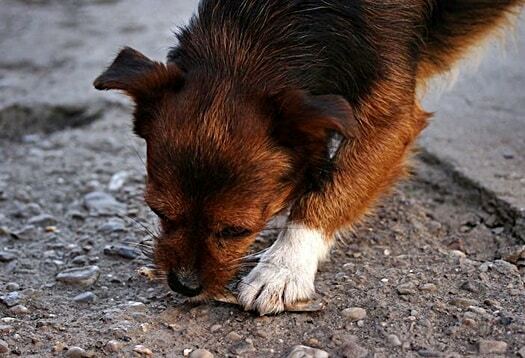 Dirty gloves, used tissues, discarded takeaway scraps – it’s all fair game for Fido, as are the insects and bugs. Some canines see these as a fast-moving feast and will go out of their way to hoover them up. How do I stop my dog from eating bugs? You must restrain your dog physically or train them with voice commands. Controlling your dog involves keeping your pet on a short lead or using a muzzle. A strong voice command, such as “leave it!”, will usually work. 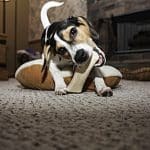 This article will discuss your dog’s bug-eating behavior in more detail, looking into why it happens and how you can prevent it in the future. 1 Why Does My Dog Eat Bugs? 2 Is it Dangerous for My Dog to Eat Bugs? 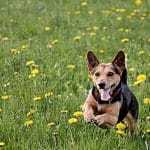 3 How Can I Train My Dog to Stop Eating Bugs? 4 Should I Muzzle My Dog to Stop Them Eating Everything? 5 Is it OK for Puppies to Eat Bugs? 7.1 What Happens if My Dog Eats a Fly? 8.1 What Happens if My Dog Eats a Bee or Wasp? 9.1 What Happens if My Dog Eats a Moth? 10.1 What Happens if My Dog Eats a Beetle? 11.1 What Happens if My Dog Eats a Cricket? 12.1 What Happens if My Dog Eats a Spider? 13.1 What Happens if My Dog Eats an Ant? 14.1 What Happens if My Dog Eats a Cockroach? 15 Are Ladybugs Toxic to Dogs? Why Does My Dog Eat Bugs? This behavior is similar to when a dog eats dirt or potting soil, with one fundamental difference. A dog eating a bug is rarely a problem related to the psychological condition of Pica. Instead, it will be a matter of your pet exploring the world with their mouth and nose, and their primal hunting instincts kicking in. Your dog will be happily checking our new surroundings, using their keen sense of smell to get an insight into the lay of the land, and then something will appear in the corner of their eye. The next thing you know your dog will want to give chase, and the logical progression in canine thinking from, “I wonder what is” becomes, “I wonder what that tastes like”! Also remember that, even though they are now domesticated, dogs are still wild animals at heart. This means that they have instincts that allow them to survive if separated from their human companions, at least for a while – and that means sourcing food from outside of a tin or kibble sack. 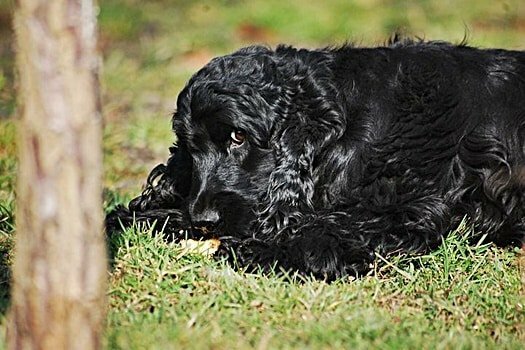 Unless your dog is eating bugs compulsively, eschewing traditional forms of nutrition in favor of hunting down insects for every meal, there is nothing to worry about – it’s perfectly normal canine behavior. Is it Dangerous for My Dog to Eat Bugs? As with all things, there isn’t a yes-or-no answer here. Bugs are not part of a domestic pet’s typical diet, and a canine couldn’t live on creepy-crawlies alone, that’s for sure. However, it isn’t necessarily a cause for panic if your pet does find himself or herself ingesting the occasional insect unless they seem to be in pain. Only a small number of bugs will be harmful to your dog. All the behaviors that would ordinarily raise alarm bells and lead to you seeking the insights of an animal healthcare professional. These consequences could be a result of your dog being allergic to the bug, or more likely, that they have ingested a pesticide or anti-pest treatment at the same time. 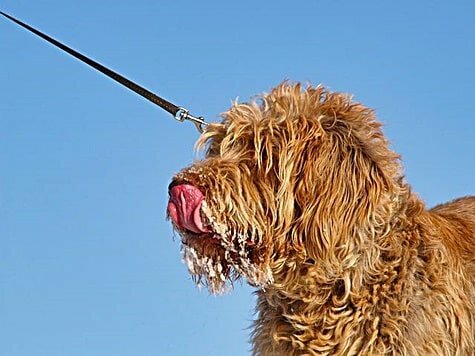 Do try to be vigilant about watching where your dog is sniffing and licking while on a walk. So, there is no need to rush your dog to the vet the moment they eat a bug if they do not seem perturbed by the experience. All the same, it isn’t necessarily something that you wish to encourage. Many dogs already love to chase squirrels and birds while off-leash – throw bugs into this equation as well and taking a leisurely, uninterrupted walk will become almost impossible. How Can I Train My Dog to Stop Eating Bugs? As suggested previously, the two most impactful methods for coaching a dog out of eating bugs are physical restraint and voice commands. If you have to keep your dog on a very short leash and insist on them walking to heel, they will struggle to find a way to escape your attention and chase after bugs – whether they are flying through the air or scurrying along the ground. If your dog is close by and within grabbing range, you can also quickly pull them away if they show any interest in a bug. Theoretically, they will soon learn that chasing a bug equates to physical discomfort. The downside to this is quite apparent – no responsible pet parent wants their dog to be in physical discomfort, especially as it could result in your dog becoming afraid of you. You could consider using physical restraint if you are confident that you can do so without causing any harm (Global Wildlife Resources have insights into this practice), but try to avoid it wherever possible. Vocal commands such as, “leave it!” are among the most pivotal elements of dog training, like puppies, are prone to popping everything they come into contact with in their mouths. This could result in your dog eating poop, or indeed bugs. You need to keep that kind of behavior under control, and the easiest way of doing so is issuing a short, sharp voice command. It’s not the words that matter so much as the tone of voice that you use in these situations, as you will need to break the spell that your dog finds himself or herself under while chasing a bug. Have two sets of treats available, one load in your hand and the other elsewhere. Close your hand containing the treats into a fist, and hold it out to your dog. Let your dog attempt to get access to these treats; once they give up, make a fuss of them and provide a treat from the separate stash. Repeat this many times, and your dog will stop paying attention to your fist. This is the time to start using the “leave it” command to get your dog used to it. Next, repeat the process above but open your fist and say, “leave it!” – if your dog tries to get the treats in your hand, you should close your fist to stop them. Again, when your dog stops trying to get these treats to reward them with the others, try making a fuss of them. You can take this training further by placing treats all over the home and backyard, just making sure that you can pull them away if your dog tries to get hold of them. Continually tell your dog to, “leave it!” as you do so – remember to drive that command home. Reward your pooch when they do just that, and sooner or later your dog will get learn the importance of the command. You could also use it at mealtimes to toss in some bonus training time relating to something special to them. If this still has no impact, you may need to resort to physical restraint when attempting to prevent your dog from eating bugs, but it may be better to leave them to it. You may feel bad for the poor insects, but your dog is higher in the food chain and may have to make their own mistakes! Should I Muzzle My Dog to Stop Them Eating Everything? A muzzle should always be a last resort, and eating bugs is rarely reason enough to resort to forcing your dog to wear such an accessory. If you are going to get your pet to wear a muzzle, however, don’t just strap it over their face and leave them to deal with it. Instead, you’ll need to get your pet used to wearing a muzzle through some training. 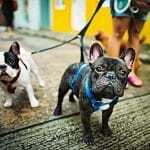 TV personality Cesar Millan has some suggestions as to how to go about this, but it largely revolves around being patient and introducing your pet to the idea slowly and steadily. Another technique for preventing a dog from resenting and fearing their muzzle is to apply a little peanut butter or cream cheese to the tip of the item, leaving your dog free to lap away at this from within the confines of the mouth harness and have at least some positive associations. Is it OK for Puppies to Eat Bugs? What’s good for the goose may be good for the gander as far as the old saying goes, but is what is good for the dog good for the puppy? A puppy is more likely to grow sick after eating a bug than a healthy adult dog, because their immune systems are not yet firing on all cylinders. In addition to this, a puppy may not yet have an understanding of what they can and cannot eat, and as a pooch paren,t you will probably be unaware of any allergies that your pet may be living with. All of this, coupled with the fact that your puppy will need to be trained at an early age that not everything can be munched upon, means that you should be a little more vigilant about preventing your pup from making a habit of dining on bugs. If you can nip the behavior in the bud early enough, your dog will theoretically not repeat it as they grow older. If your older dog had expressed no interest in eating bugs but has started to do so, keep an eye out for any other erratic behaviors. Sadly, this could be a sign of canine cognitive dysfunction, aka dog dementia. If your dog’s new peccadillo for eating bugs coincides with one or more of the above behaviors, get them to a vet ASAP. Flies will be hard for a dog to resist. Watch your pet next time a common housefly starts to buzz around their head, and you’ll probably notice they seem somewhat entranced. This infiltrator is making a strange noise, and it’s moving in rapid, jerky movements, it’s tantalizingly just out of reach. All of that adds up to an irresistible game of chase for a dog that wants to catch that fly. This doesn’t mean that your dog harbors any ill will toward the flying pest – in fact, Fido probably has no intention of actually catching the critter, as that would put a stop to the game. All the same, accidents will happen. Sometimes, amidst all the excitement, the fly will end up in your dog’s mouth – and belly. What Happens if My Dog Eats a Fly? We have all heard the cautionary tale about the old lady that swallowed a fly, but don’t panic – it shouldn’t apply to your dog. The only time that you’ll need to worry is if your dog ate a freshly deceased fly from the ground that had been killed by bug spray. The spray in itself is only mildly toxic and should not be potent enough to do damage to a healthy pet, but if your dog has any form of respiratory difficulties, this could aggravate them. These flying insects, unlike flies, can be hugely dangerous for your dog to mess with. The concept remains similar – your pet will be curious, and want to investigate just what this noisy, flying animal is. Couple this with the fact that bees and wasps will often be found in heavily scented flowers or food and you have a recipe for unwelcome interaction. What Happens if My Dog Eats a Bee or Wasp? Naturally, the problem arises if the wasp or bee does not take kindly to this interest in their affairs, and opts to sting your dog. This could happen inside the mouth and lead to a great deal of swelling that closes your dog’s throat up and makes it tricky for them to breathe or swallow. Our guide to bee stings will shine more light on how you could proceed following such an incident, alongside our insights into allergic reactions in dogs. Rounding out the flying pest segment of our round up are moths, which again your dog will be drawn to chasing like a … well, like a moth to a flame. The hypnotic beating of wings and fluttering around their territory will almost certainly be impossible for your pooch to resist. What Happens if My Dog Eats a Moth? Nothing much – they’ll crunch, swallow and move on. Moths are not toxic to canines, and should not cause them any intestinal discomfort. There is a multitude of different beetle species in the US that your dog may look to snack on, mainly because most of them have a tasty, crunchy exterior shell. Most of these beetles are as harmless as John, Paul, George, and Ringo, but it may be advisable to brush up on your bugs by checking Insect Identification’s index of creatures that will be found in the States. What Happens if My Dog Eats a Beetle? If it were a stink beetle, your dog would have foul breath and really shouldn’t lick your face for a while! They will also learn a valuable lesson about how not everything is food. Most other beetles will be chewed and swallowed with little to no ill effects, though as always it’s best not to let your dog get a real taste for them. June bugs are another species of beetle, sometimes known as May beetles, which are a favorite snack for dogs. This is nothing to worry about unless your pet eats a whole lot of the six-legged critters at once. This could lead to vomiting and diarrhea, but the same can be said for an excess of anything that is an unconventional food source. 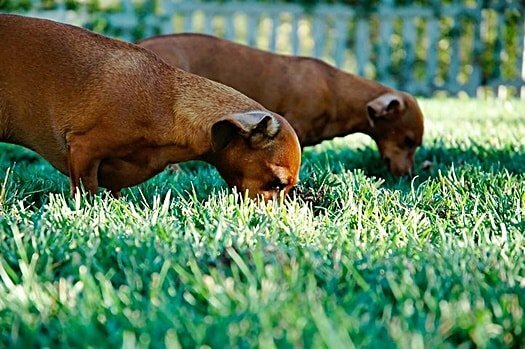 Many dog breeds love to hunt crickets through fields and parks, and if they manage to catch them, they will chow down upon the bugs in question. What Happens if My Dog Eats a Cricket? Sometimes, the tough exterior of a cricket may cause your dog to throw up – they won’t be able to swallow the bug down into their digestive tract. Beyond this, however, there will be nothing to worry about. Your pet should be fine once they have purged the cricket from their throat – and if they do digest it, it’ll just be an extra protein source. Spiders can cause endless fascination for dogs, mainly because they move so quickly. You may often notice that your dog looks up suddenly from what appeared to be a contended doze, and starts eyeballing the floor or wall intently – this is probably because they spotted an eight-legged intruder in your home. Dogs chasing and eating spiders could be considered a good thing if you are an arachnophobe and do not want to deal with them yourself, or unwelcome behavior if you are superstitious and believe that the demise of a house spider brings bad luck. What Happens if My Dog Eats a Spider? Your dog should not be harmed by the experience. There are few spiders in the USA that are venomous – and aggressive – enough to do any harm to a dog, and your pet will need the reflexes of a superhero to catch one anyway. If you want to err on the side of caution, take a look at the list of spider species that you may find in the country on Venombyte. Ants are a common sight all over sidewalks and grass through the world, so your dog will no doubt grow curious and try to sample one of them sooner or later. What Happens if My Dog Eats an Ant? If it’s a typical black marching ant, then your pet’s impersonation of an aardvark shouldn’t be a problem – other than the fact that ants are tiny, and your dog may end up swallowing all kinds of other dirt and unpleasantness in the process. If it’s a fire ant, however, a nasty and painful sting could follow – and that could get very unpleasant and dangerous if your dog disturbs a colony. Fire ants are most common in the Southern states of the USA, so be vigilant in this part of the world. Your dog’s predatory instincts may be activated by the scuttling of a cockroach, especially if they know how much you despise them as a human and wants to do you a favor. What Happens if My Dog Eats a Cockroach? Your dog may throw up because the hard shell of the bug has been tricky to swallow, or the wings of the bug have irritated their throat. More often than not, however, your pet will go about their day after their unconventional snack. 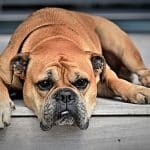 If your dog does display any signs of pain, distress or discomfort after eating a cockroach, get them to a vet. The bug may have previously been rolling around in something unsavory, and that is what is causing the reaction in your dog. Are Ladybugs Toxic to Dogs? The good news is that the cutest bug of them all is not toxic to dogs. The bad news is that a very close relative, known as the Asian Lady Beetle, looks almost identical to a common or garden variety ladybug and is very toxic indeed. If you see your dog attempting to play with a ladybug, lead them away as quickly as possible just in case it’s an Asian Lady Beetle – unless you’re an entomologist with excellent eyesight, you won’t be able to tell them apart at a glance. Alternatively, if your dog starts to foam at the mouth or drool uncontrollably, speak to a vet – this is a warning sign that your pooch has been bitten by one of these bugs. Joking aside, hunting and eating insects is a perfectly natural course of action for a dog. However, it is one that – like a toddler eating worms – should be grown out of and discouraged before it becomes a habit. It may rarely be outright hazardous to your dog’s health unless they also imbibe something unpleasant at the same time, but there is no nutritional value to chewing on a bug. And besides, the poor creepy-crawlies have enough natural predators without Fido adding his name to the list.